___________________________ branch of _________________________________ Bank in favor of “Indian Reprographic Rights Organisation”. 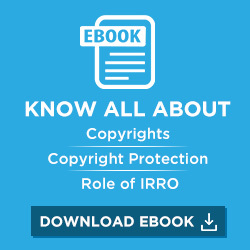 I certify that I have gone through the Terms and Conditions of the IRRO License and agree to abide them. The information provided on this form is true, complete and correct to the best of my knowledge and belief. A) Royalty must be paid in the 1st quarter of the financial year i.e. between April 1st to June 30th every year. Late payment will attract a penalty of 10% every quarter or part thereof. B) All payments are to be made only by way of demand draft, pay order, or crossed cheque in favor of “Indian Reprographic Rights Organisation” only. C) IRRO is authorized to send notice for payment and collect the royalty against temporary receipt. Final receipt will be issued only after receipt of clear payment by IRRO Head Office, Delhi. D) VAT shall be payable extra as applicable in each territory. E) Royalty rates above are applicable strictly for single campus only. For each campus royalty calculation as well as royalty payment shall be made individually and separately. This shall be irrespective of parent establishment or affiliation or its head office having paid for itself. H) Receipt of IRRO tariff scheme constitutes “Notice” under law. Failure to procure valid license (s) shall be prosecutable under various civil and criminal laws and procedures. I) The license will only be effective from the date mentioned in the agreement and will continue for the current financial year. J) If the licensee does not notify IRRO that it doesn’t want to renew the license, 30 days prior to the expiry date the license will automatically be deemed to be renewed for a further term of one financial year and annual fees shall be payable by the licensee according to the renewed term and tariff. Licensed copies cannot be sold, hired or exploited for the purposes other than the defined purposes of the license. The license can be used for the benefit of the authorized person (s) in the licensed organisation only. The licensee shall not edit, amend, manipulate, add to or delete from digital copies nor shall it authorize the same. L) License fees in consideration for the License: The licensee shall pay to IRRO in each financial year of the term of license, on the basis of the tariff scheme. Such annual fee shall be due and payable within 21 days of date of invoice. Subscribe to our newsletter to stay abreast with the latest happenings in the publishing industry.